Haaaayyyyy wouldn't you know it! 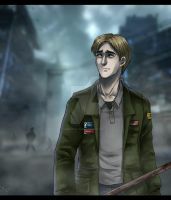 More Silent Hill 2 fan art! I just felt bad about last night's upload being such a shoddy-looking mess, so I took some time today and did this pic to make up for it. That saying, "You're only as good as your last drawing," always has a habit of bugging me to death. Besides, James is such a great character. Drawing him is only ever a pleasure. I love the pose and his expression, also your colouring! GAAAASP Finished the game last week w my brother GOOOOSH love love love the way you drew this!!!! !...ahem, okay i feel better, got carried away again ..Anyway,amazing job again, no need to say! Have you finished the game at all yet? Oh, yeah. Missed the Great Knife, though. I mean, I know it's too slow to be of any use as a weapon, but it would've been nice to get it. I'll be honest, I've only watched multiple other people play it. I've never played it myself D: I'm too scared. Whoa... Dats a hella big knife. I KNOW RIGHT! And I missed picking it up in my first (and only) playthrough of the game. I'm still a little bummed about it. But I was totally panicking, running away from Pyramid Head like the scaredy cat I am. NEXT TIME FOR SURE, THOUGH!!!! Aww, too bad. What's the game called? USE THE HELLA KNIFE, I MUST. Haha! Yeah he's exactly the kind of guy to have over on your birthday to cut the cake! And if he brings a date to the party, it'll probably be Pyramid Head, so everyone will just lose it and run away! BEST PARTY EVER! I've never played the game but I'm just glad to see art from you again. Yeah I've been busy with commissions lately. I'm just happy to be working. Thanks for your constant and wonderful support!!! I thought your art work lately was amazing. The-Ez, your work is amazing, as always. How much time did you spend to learn to draw in what I would call "Disney style" so well? You can just call me Ez! And thanks! Learning this style took me a few years. I've only been drawing like this since, hmmm, 2010. I needed a good while to pick up exactly how to simplify the anatomy (it's SO easy to overdo and overdraw), and I'm still learning new things every day. I highly recommend you check out livlily.blogspot.com/2010/11/m… if you're keen on the style. It's a fantastic resource! So great! You're my new best friend! But seriously, this blog will help a lot. Thanks! I love how you colored it, it kind of looks like a screenshot from a movie. Very well done. That's an awesome compliment! Thank you very much!!! My pleasure! your style is gorgeous!!! I have never played this game, but I have watched some videos. It's a pretty scary game. I've found that watching it and playing it are very different experiences, but both are equally good! Either way you're either scratching your head or sweating bullets.